Prime Minister Justin Trudeau and U.S. President Donald Trump are both talking up the benefits of a new trilateral trade pact between Canada, the U.S. and Mexico, saying it will grow the middle class and boost all three countries' economies. Trudeau said the successor to NAFTA — the United States-Mexico-Canada Agreement (USMCA) — will modernize and stabilize the economy for the 21st century, guaranteeing a higher standard of living for Canadians for the long term. At a news conference in Ottawa, the prime minister said striking the deal was "no easy feat" and Canada got there by maintaining its focus and collective resolve. He defended Canada's concessions on the dairy sector, promising to address the "anxiety" with adequate compensation for affected farmers and to protect the supply management system. Warning that the agreement must still be ratified by all three countries, Trudeau said the tentative deal means economic stability for the continent. "Free and fair trade in North America, a trading zone that accounts for more than a quarter of the world's economy with seven per cent of its population, is in a much more stable place than it was yesterday," he said. "We now have a path forward." A dispute resolution process (formerly Chapter 19 of NAFTA) remains in place. The U.S. gets access to 3.6 per cent of Canada's dairy market. Tariffs on steel (25 per cent) and aluminum (10 per cent) remain under Section 232 national security grounds. Auto tariff exemptions for 2.6 million Canadian autos exported to the U.S., far exceeding the current export rate of 1.8 million. Duty-free purchases through e-commerce jump to $150 from the current $20. Trudeau and Trump spoke by phone earlier in the day, with the PMO issuing a statement extolling the benefits of the "new and modern trade agreement" reached last night. "The prime minister and president stressed that the agreement would bring the countries closer together, create jobs and grow the middle class, enhance North American competitiveness and provide stability, predictability and prosperity to the region," the statement reads. The leaders agreed to keep in close touch to move the agreement forward. Trudeau also spoke with Mexican President Enrique Peña Nieto about the deal; both leaders said it will strengthen their countries' close partnership and create good, well-paying jobs. During a news conference in Washington, Trump called the agreement "truly historic news" for the U.S. and the world, replacing the "worst trade deal ever made" (NAFTA) with one based on fairness and reciprocity that closes what he called "terrible loopholes." Trump confirmed that hefty tariffs the U.S. imposed on steel and aluminum will remain intact until there is a new system in place, such as an import quota. "We are not going to allow our steel industry to disappear," he said. Trump said the agreement will transform North America back into a manufacturing powerhouse. The president said he and Trudeau butted heads over several issues, but in the end agreed to a deal that benefits both countries, as well as Mexico. "This is a terrific deal for all of us," he said. Trump also took time to praise Trudeau, despite what he called the "strong tensions" between the two leaders during the trade talks. "He's a good man and he's done a good job, and he loves the people of Canada," he said. Conservative Leader Andrew Scheer said he still wants to scrutinize the details of the deal, but argued today it appears to be worse than NAFTA. He accused Trudeau of focusing on "politically correct posturing" and ultimately backing down to Trump's demands. "I would have focused on economic issues. I would have focused on making sure that we saw an end to softwood lumber tariffs, and end to steel and aluminum tariffs," he said. NDP Leader Jagmeet Singh said the deal fails to deliver on Liberal promises to make Indigenous rights, gender parity and the environment central to the modernized agreement. He also accused the government of betraying dairy producers and eroding supply management. "The deal may have a new name, but we've signed a deal that's worse than the previous one," he said. 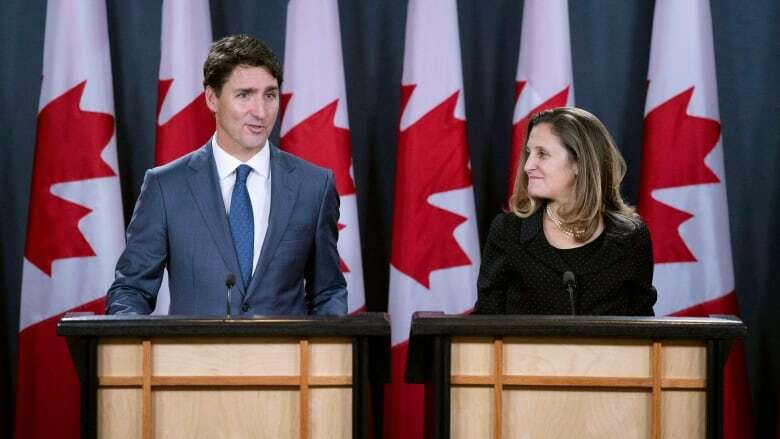 Foreign Affairs Minister Chrystia Freeland said negotiators will continue to fight to have the lingering tariffs on aluminum and steel lifted, insisting the integrated industry is "balanced and mutually beneficial." She said her team will build on the momentum and intensify discussions on the tariffs. "We have a little bit of wind in our sails, and we are going to very much continue to work on this issue," she said. "But it is separate from the NAFTA talks." Freeland highlighted the benefits of the agreement, including the fact it fends off auto tariffs Trump had threatened to impose. It also improves labour and environmental standards while protecting cultural industries, she said. "This is a victory for all Canadians," she said. Former Conservative prime minister Brian Mulroney issued a statement calling the agreement "a highly significant achievement for Canada" that will benefit all three countries. "I have not yet had the opportunity to study the full text – and frequently the devil is in the details – but Canada appears to have achieved most if not all of its important objectives in this lengthy and challenging set of negotiations," he said. "I said at the beginning that there is no Conservative or Liberal way to negotiate a free trade agreement — there is only a Canadian way. This has been the government's approach as well and I commend all — from the prime minister down — who contributed to writing this vital new chapter in the ongoing drive for greater Canadian strength and prosperity." The new trade deal Canada has agreed to sign with the U.S. and Mexico is being applauded for including measures that will protect jobs and preserve cultural industries — and panned for concessions that could harm the dairy sector. Calling it a "great day for Canadians," the head of the country's largest private sector union said the USMCA will stem the flow of jobs to Mexico, protect cultural identity and preserve a formal process for settling trade disputes. 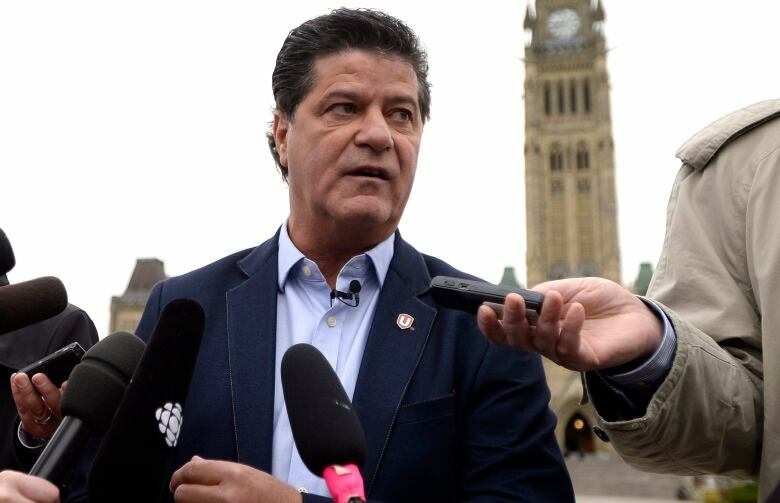 Jerry Dias, national president of Unifor, conceded the deal isn't good for dairy, but said overall the USMCA will yield benefits for Canadian workers and the economy. "There are some incredible victories in this deal, things we've been arguing and fighting for for the last 24 years," he said. Dias said another downside to the deal is a change to intellectual property rules that will extend the data protection on biologic drugs to 10 years from eight. But he expects a national pharmacare plan will buffer Canadians from escalating medical costs. "Am I comfortable? The answer is yes. Is it a perfect deal? The answer is no. But are we better off today than we have been over the last 24 years? I'll say emphatically, the answer is yes," he said. Dias said he is pleased the deal fends off the threat from President Trump to slap 25 per cent tariffs on Canadian automobiles. While the reformulated deal does not lift the existing tariffs on steel and aluminum, Dias said he believes it's better to find a permanent solution through the dispute process than to have a quota that could lead to a "generational" problem. Jean Simard, president of the Aluminum Association of Canada, said he was disappointed that the tariffs weren't addressed in the new deal. "We are certainly glad to see that the three countries have reached an agreement. We are very disappointed that section 232 (tariffs on national security grounds) on aluminum and steel have not been dealt with, and we are strongly urging Minister Freeland and Prime Minister Trudeau, who has spent lots of time in our plants recently, to remember our thousands of workers and ensure that Canada's world class aluminum industry can grow free of tariffs and quota." Ontario Premier Doug Ford expressed concern about the impact of the deal on his province's agriculture sector. "While I'm optimistic that the USMCA announced today will create continued opportunities, I remain concerned about the impact of Canada's reported concessions on Class 7 milk and access to Ontario's dairy market could have on our agriculture sector. We also remain concerned about the remaining steel and aluminum tariffs," he said. "Our government will be speaking directly with industry representatives from Ontario's steel, aluminum, auto and agriculture sectors to determine the impacts of this deal." The Dairy Farmers of Canada (DFC) said they have paid the price to conclude the trade agreement. "The announced concessions on dairy in the new USMCA deal demonstrates once again that the Canadian government is willing to sacrifice our domestic dairy production when it comes time to make a deal," said DFC President Pierre Lampron in a statement. "The government has said repeatedly that it values a strong and vibrant dairy sector — they have once again put that in jeopardy by giving away more concessions." Dennis Darby, president of Canadian Manufacturers and Exporters, called the agreement a "significant step" that preserves integrated manufacturing supply chains and will help create certainty for business. 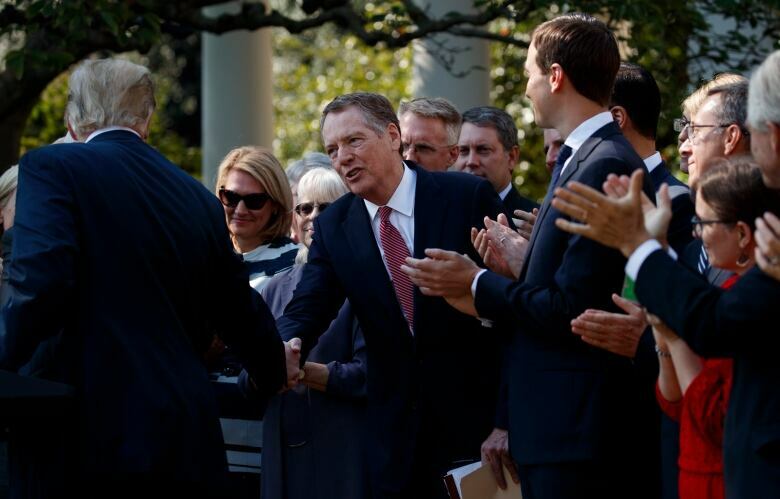 "The manufacturing sector is the cornerstone of the North American economic relationship and the reason this trade agreement is so critical," he said in a statement. "We worked closely with the government throughout the negotiation to ensure the integrated manufacturing sector would remain unharmed and strengthened where possible. We believe the USMCA has accomplished this objective."